INTERESTED IN HANDLING YOUR OWN DOG IN CONFORMATION? Learn the art of showmanship in Handling Classes taught by Phyl Scalf and Robert Churchey. From teaching a dog to "hold," to gaiting the dog, to understanding ring procedure, the classes offer a positive learning environment that taps the power of the handler/dog relationship. To contact us about the classes, click on the "Contact Us"
bar on the side bar menu or call 602-320-2437. 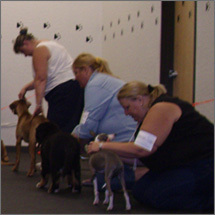 Conformation Handling Classes are offered at two locations: Bark Avenue in Mesa, AZ; and, Shopper's Supply in Chandler. AZ. 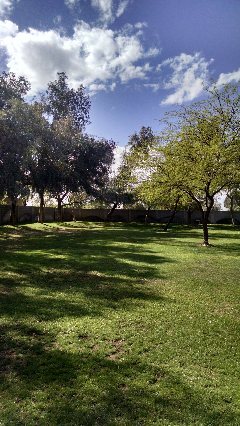 Bark Avenue (located on south side of McKellips, east of Lindsay in Mesa) is an outdoor venue on grass. These classes are taught as scheduled on most Wednesdays from October through May. Shopper's Supply, 2880 S. Alma School Road (northwest corner of Alma School and Queen Creek), Chandler, AZ is held in a climate controlled warehouse area on concrete when warehouse space is open. During heavy retail volume months, classes are held on pavement in the parking lot immediately adjacent to the west end of the building. When classes are held indoors, students park in the front parking lot of the store and gain access to the class area by going through the store to the back of the building. The door to the class area is in the middle of the back wall. Dogs should NOT be left unattended in vehicles in the parking lot. Information pertinent to both venues. Please keep all dogs on leash. If you are bringing gear such as crates and chairs, it would be advisable to bring it in on a cart (great practice for a dog show). There are no chairs for public seating in the class area so if you think you'll need a chair, please bring one. Also be sure to bring drinking water for you and your dog. Bark Avenue and Shopper's carry pet supplies and dog food. Classes are held during regular business hours and we encourage our students and dog fanciers to shop and support these businesses. Handling Classes are a structured practice session to train handlers for conformation competition. It is serious training about how to professionally present your dog and have fun doing it. Progressive and positive strategies are taught so that the handler-dog relationship and bond is optimized. All Breed classes are open to dogs of all sizes and breeds. For Drop In Classes, the handler should be familiar with basic ring procedure and have some experience in competition. If you are new to the world of dog shows, we highly recommend that you take an Introductory Class before starting the Drop In Handling Classes. NOTE REGARDING JUNIOR SHOWMANSHIP: Robert is a permit status AKC judge in All-Breed Junior Showmanship, Rhodesian Ridgebacks and Tibetan Spaniels and Phyl is an approved AKC All-Breed Junior Showmanship judge. Certain restrictions apply to those of their students who exhibit in Junior Showmanship or show to Robert in breed competitions. AKC Rules state: "No entry shall be made at any conformation show under a judge of any dog or owner for which said judge has provided handling and presentation instructions in either conformation or obedience training classes. This restriction will apply within one year prior to the date of the show." (Rules, Policies and Guidelines for AKC Conformation Dog Show Judges, "Conflict of Interest," Section P, page 4.) These restrictions do not apply to those children (age 5- to 9-years-old) participating in Pee Wee Special Attractions. If you have questions regarding this, please contact us via the "Contact Us" icon or call 602-320-2437 or contact AKC Judges Operations through www.akc.org. Sundays, 10:00 A.M. APRIL 14, 28. Park in general parking out front and go through store to the double doors to the left of the firearms counter. During the busy retail season, Shopper's Warehouse (where we hold classes) may be fully stocked. This means there would be no open space available that would provide a safe environment for holding classes in the warehouse area. Due to this situation, we will hold classes outdoors in the parking lot on the west end of the building on days when the warehouse is not available. 3109 E McKellips Rd #104, Mesa, AZ 85213. Wednesdays, 10:00 A.M. APRIL 17, 24. Bark Avenue Pet Supply is on the south side of McKellips, east of Lindsay and west of Val Vista. Once in the parking lot, go around the south side of the building. Approach the gate slowly and it will open. Parking is along the right side of the road and around in the back. Be sure to park only in designated areas and keep all fire lanes clear (curbs are painted red where there is a fire lane). This is a bring-your-own-chair venue if you will need a place to rest during class. Please bring ample water for yourself and your dog. The area where class is held is fenced but gates are not always closed. Click here for details on our special deal incentives for Handling Class participants. Classes are held by appointment on Saturdays or Sundays, 11:00 a.m.
Introduction to the basics of handling a dog in conformation -- from which lead and collar to select, to how to hold the lead, to how to do a down and back and a triangle. This class is for the novice handler with little or no ring experience. Class size limited to 4 handlers. Prerequisite to Drop-in Handling. Fee: $20 per meeting for 50 minute class. Participants in Handling Classes and events held by RUYA LLC are required to sign a Participation Agreement in order to take part in the class or activity. Children and youth under the age of 18 must be accompanied in class by a parent, guardian or an agent designated by the parent/guardian. · All classes are offered on a pre-paid basis and that there is no refund for missed classes. · There is a $35 charge for checks returned unpaid by the bank. · Multiple dogs handled by one person are treated as one dog in terms of class participation. · Dogs must be healthy and free of any communicable disease. · Dogs must be kept on lead at all times (when not crated) and kept under control by the handler. · Dogs that exhibit inappropriate social behavior may be barred from future participation in any class and no refund of fees paid will be made. · Owner/handler provides equipment for their dog(s); prong collars and Flexi-leads are NOT permitted on the premises of class. · Owner/handler must clean up after their own dogs. · Owner/handler provides crates for ring side if multiple dogs are handled. · Children and youth under the age of 18 must be accompanied during the entire class time by a parent/guardian or designated agent. · Open-toed shoes, flip flops and/or sandals are not recommended. · No portion of the class may be video taped for electronic or other media publication without the permission of the instructor. By participating in classes or activities sponsored by Ruya LLC, participants automatically give permission for standard photo use release. · Ruya LLC retains the right to refuse service to any person whose behavior is inconsistent with the AKC Code of Sportsmanship and/or who exhibits behaviors that, in the opinion of Ruya LLC, put other individuals or animals at risk. The use of prong collars and/or devices designed to create an aversive learning atmosphere are not permitted. A copy of policies is avaialbe on request at any class. Each participant is required to sign the Participation Agreement in order to participate in any activitiy held by RUYA LLC. Phyl Scalf and Robert Churchey started in the world of purebred dogs as owner handlers. While balancing their family responsibilities and careers, they were active in all breed and specialty clubs. In 1999, they began to handle professionally and in 2007, starting offering their own Handling Classes. Each had taught classes for a local kennel club so offering their own classes was a natural progression. Phyl's dedication to sharing knowledge and mentoring has been reflected in both her vocations and avocations. She holds a Master of Science in Educational Psychology with an undergraduate degree in Teaching Psychology and Sociology. She began her non-dog career as a teacher and then moved into program development. She advanced from program development to executive management in the nonprofit sector. She currently is also the lead artist at Ruya Creations, a division of RUYA LLC. Robert has a Master of Science in Criminal Justice and has served as a municipal police officer. He taught in a community college and was a trainer for various subjects related to law enforcement. He has served in various volunteer positions in nonprofit social service agencies. Phyl, Robert and their two daughters Shannon and Ryan moved to Arizona in 1988. They raise and breed Rhodesian Ridgebacks and Tibetan Spaniels. Every aspect of their lives reflects their passion for dogs and their love for the sport of purebred dogs. Each holds Permit Status as AKC Juniorshowmanship Judges for All-Breeds.